The Thing, also known as The Great Seal Bug, was a passive covert listening device, developed in the Soviet Union and planted in the study of the US Ambassador in Moscow, hidden inside a wooden carving of the Great Seal of the United States. It is called a passive device as it does not have its own power source. Instead it is acivated by a strong electromagnetic signal from outside. The device was codenamed LOSS by the US and RAINDEER (Северный олень) by the Soviets. 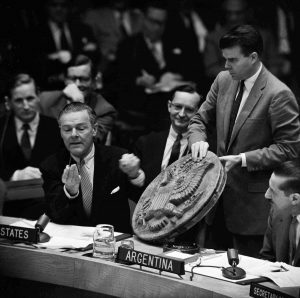 US ambassador Henry Cabot Lodge showing ‘The Thing’ at the United Nations, a Soviet listening device hidden inside a wooden carving of the Great Seal of the United States that spied the American ambassador in his residence of Moscow for seven years. 26 May 1960. On 4 August 1945, the Vladimir Lenin All-Union Pioneer organization presented a hand-carved replica of the Great Seal of the United States to US Ambassador Averell Harriman, as a gesture of friendship to the USSR’s World War II ally. It hung in the library at the Residency Spaso House. In 1951, a British radio operator was monitoring Russian air force radio traffic, when he suddenly picked up the voice of the British Air Attaché loud and clear, but a survey of the embassy did not reveal any hidden microphones. A similar thing happened to an American interceptor in 1952, when he overheared a conversation that appeared to come from the ambassador’s residency at Spaso House. After a search by the Department of State, the bug was finally discovered by means of a so-called crystal-video receiver, whilst the Russians were actively illuminating the bug. The device appeared to be hidden inside the wooden carving behind the ambassador’s desk, and resembled a cylindrical microphone with an antenne rod connected to it. Tiny holes in the wood under the eagle’s beak, guided the sound to the membrane of the bug that was mounted just behind it. When the Russians knew that an important meeting would take place, they parked an unmarked van in the vicinity of the residency and illuminated the bug. A receiver, tuned to the bug’s resonant frequency, was then used to pick up the conversation in the ambassador’s office. The discovery of the bug was kept secret for many years, until the 1960 U-2 incident. On 1 may 1960, the Soviets had shot down an American U-2 spy plane over Soviet airspace, as a result of which the Soviet Union convened a meeting of the United Nations Security Council, accusing the Americans of spying. On the 4th day of the meeting (26 May 1960), in an attempt to illustrate to the council that spying between the two nations was mutual, American Ambassador to the UN, Henry Cabot Lodge, revealed the Russian bugging device, as shown in the photograph above. Ever since the Amerasia affair in 1945, the US was suspicious of bugs being planted in US embassies abroad, especially in Moscow. Although quite a few bugs were discovered in US Embassies in Eastern Europe during the late 1940s, none had been found in Moscow since WWII. Nevertheless, it was assumed by diplomats that the walls in Moscow had ears. The suspicions increased in the fall of 1951, when a British military officer who was monitoring Russian military aircraft traffic, suddenly heard the voice of the British Air Attaché loud and clear on his radio. 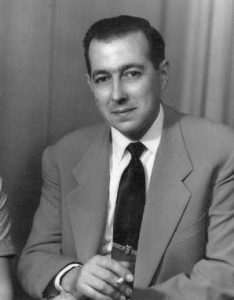 Engineer Don Bailey of the Diplomatic Wireless Service (DWS) was sent to Moscow to investigate the matter, but no bugs were found. The Russians clearly had been warned and had turned the device off. Nevertheless, Bailey reported the presence of strong RF radio signals when the device was in operation, which led the British to believe that the Russians (like they themselves) were experimenting with some kind of resonance device instead of a regular transmitter. 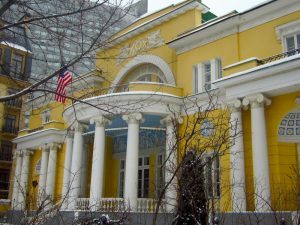 Shortly afterwards, a US military officer had a similar experience when he suddenly overheard a conversation that appeared to originate from the ambassador’s study at Spaso House, the residency of the US Ambassador in Moscow. The matter was investigated by John Ford and Joseph Bezjian of the Department of State’s security team, but they didn’t find anything. Early in 1952, after George Kennan had been appointed the new US Ambassador in Moscow, Spaso House was being refurbished for him, and Soviet workers were hired to carry out the work. Kennan believed this provided the Soviets an opportunity to plant listening devices (bugs), and ordered regular sweeps. Nevertheless, repeated technical security inspections found nothing. In September 1952, Joseph Bezjian returned to Spaso House for a more extensive search. As he believed that the Russians had removed the bugs prior to the arrival of the previous search team, he posed as a ‘house guest’ for three days and had his equipment sent in ahead of his arrival. In a pre-arranged plan, the ambassador dictated an unclassified piece of text, whilst Bezjian searched the premises with his crystal video receiver. 1 Using this receiver he was finally able to locate the bug in the Ambassador’s study. 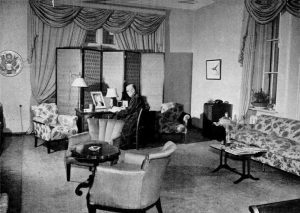 The study was sometimes used as a sitting room and, in 1947, as a temporary office by Secretary of State Marshall, during the Council of Foreign Ministers in Moscow. Marshall preferred to work undisturbed and liked the casual arrangement of the furniture. It is quite possible that the Soviets gained valuable intelligence from his presence. When Bezjian inspected the room on 10 September 1952, the signal appeared to come from the wall behind a wooden carving of the Great Seal of the United States in a corner of the room. After taking the seal from the wall, the signal disappeared and Bezjian finally realised that the bug was hidden inside the seal itself and that it was remotely (de)activated from outside the building. After a close inspection of the wooden carving, Bezjian discovered that it could be opened and that the bug was mounted in a cut-out space inside it. At first inspection, the bug resembled a microphone with an antenna attached to it. It did not have any wires or an external power source connected to it. To avoid it being stolen, Bezjian slept with the device under his pillow that night. The next day, the mysterious bug was sent to Washington (US), where it was handed over to the FBI for further investigation. As it was intially unclear how the device worked – it didn’t have any active components – it was nick­named The Thing. The FBI sent the device to their Technical Laboratory where it was inspected by personnel of the Radio and Electric Section. The preliminary conclusions were that it was a resonant cavity microphone, operating between 1650 and 1800 MHz and that the antenna had a length of 1½λ. Together with the Naval Research Lab (NRL), the FBI would later submit a detailed report about the thing, which was shared with other agencies. President Truman ordered the NRL to develop countermeasures equipment that would be able to detect and locate passive cavity resonators. Although the Division of Technical Services of the Department of State’s Office of Security (O:SY/T) was heavily understaffed in 1947, by 1961 the division had 15 SY-engineers. Between 1948 and 1961, these SY engineers were responsible for more than 95% of all listening devices found by all US Government agencies together. After the Russians had shot down an American U-2 spy plane over Soviet airspace on 1 May 1960, an incident that became known as the 1960 U-2 incident, they convened a meeting of the Security Council at the United Nations, claiming that the US had been spying on them. 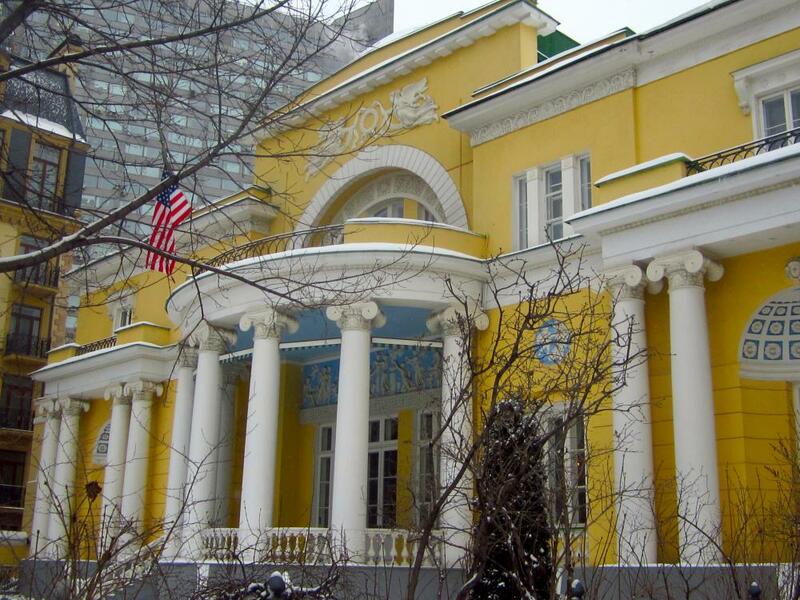 In order to demonstrate that spying was mutual, the American’s decided to disclose the Soviet bug, known as The Thing, that was found at the ambassador’s residency in Moscow 8 years earlier. The revelation of the high-tech Russian device attracted the attention of the international press and made the headlines during the next days and weeks. The short film above is a clip from a Universal-International News reel found on YouTube in September 2015. This entry was posted in Ιστορία by priamos. Bookmark the permalink.